At 8:30 in the morning we went to the hotel lobby to meet our tour guide and our 13 traveling companions. All were from the United States so there were no language challenges. 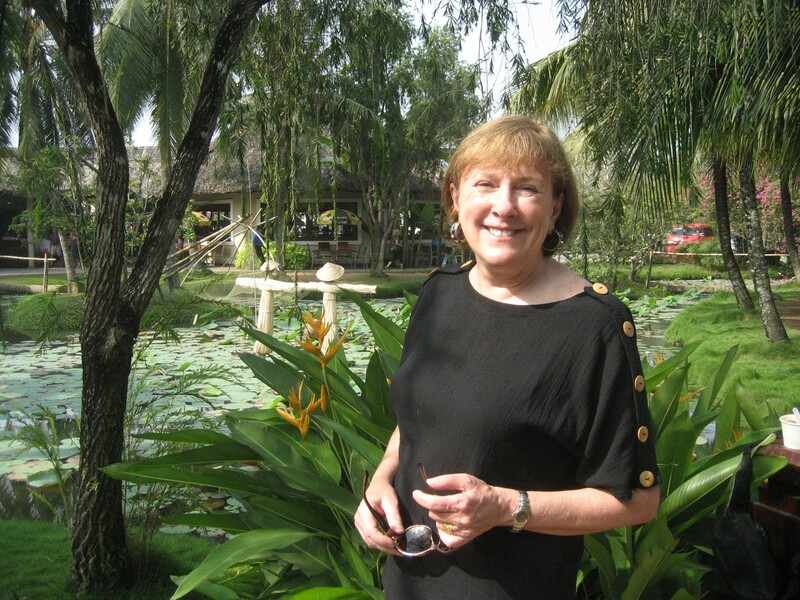 We learned that there were two sisters traveling with their husbands and two former flight attendants, with whom Pat immediately bonded. This tour was organized for us by Alexander & Roberts. 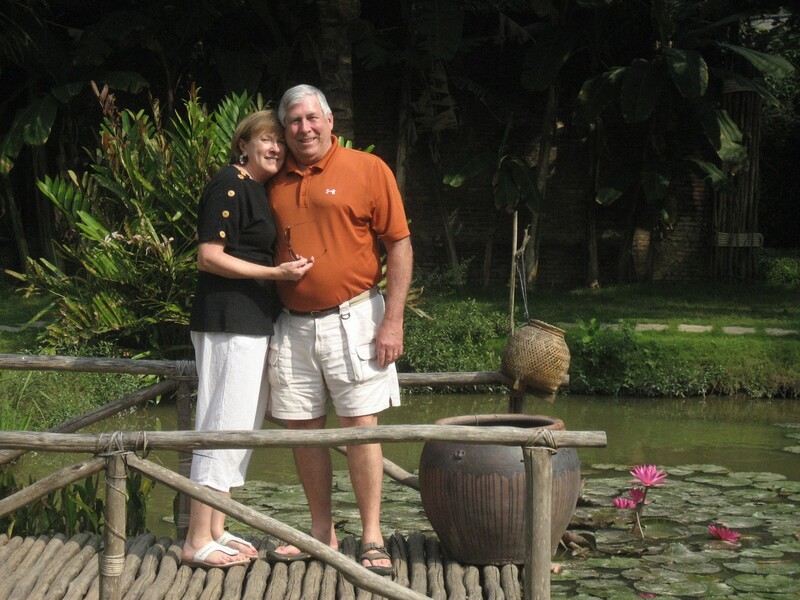 Their local tour company for both Vietnam and Cambodia was Buffalo Tours. 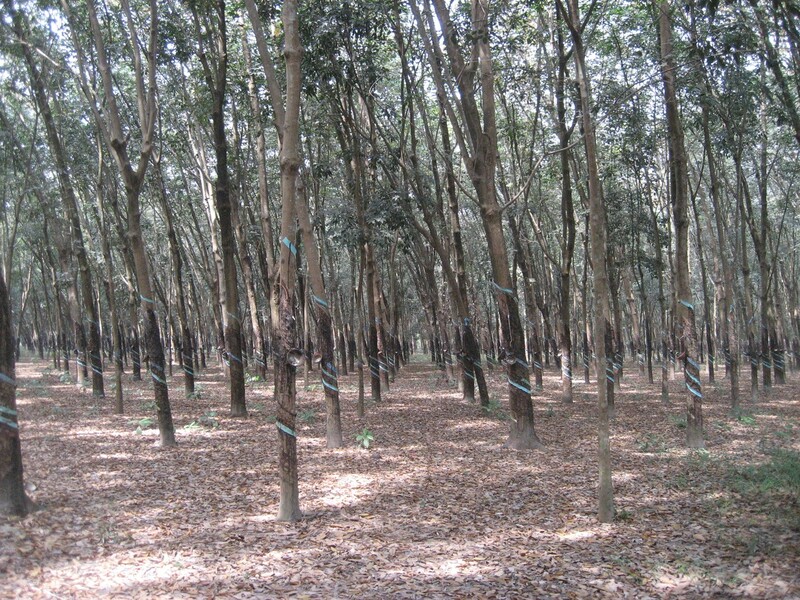 We boarded a bus and were on our way to Cu Chi to visit the famous tunnels used by the Vietcong to conceal their insurgency activities. There are reportedly 155 miles of tunnels on multiple levels. 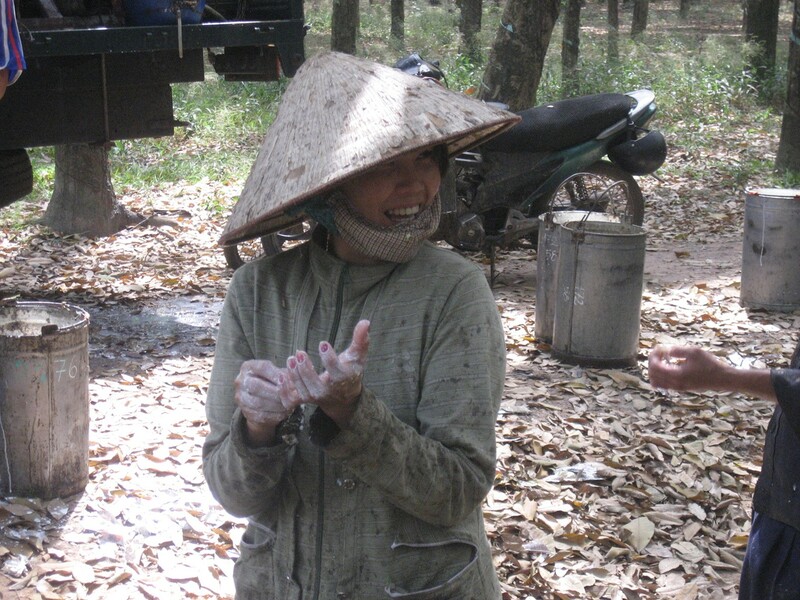 Our guide for the entire Vietnam portion of this tour, Loc Ngoc Hoang (call me ‘Loc’), was born and raised in Hanoi. 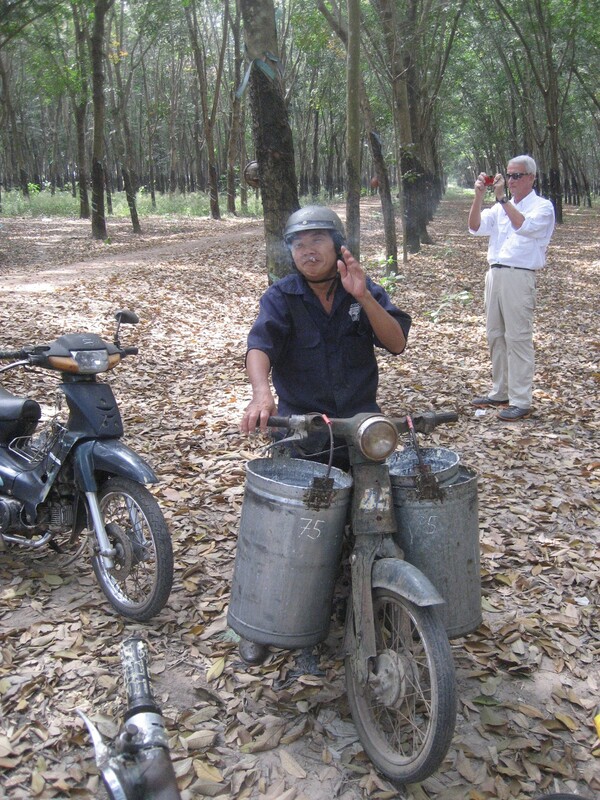 All of his history had been taught from the perspective of North Vietnam. 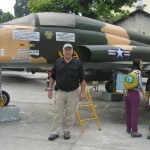 His older brother had been killed by a cluster bomb dropped from a B-52 near the end of “The War with the United States”. 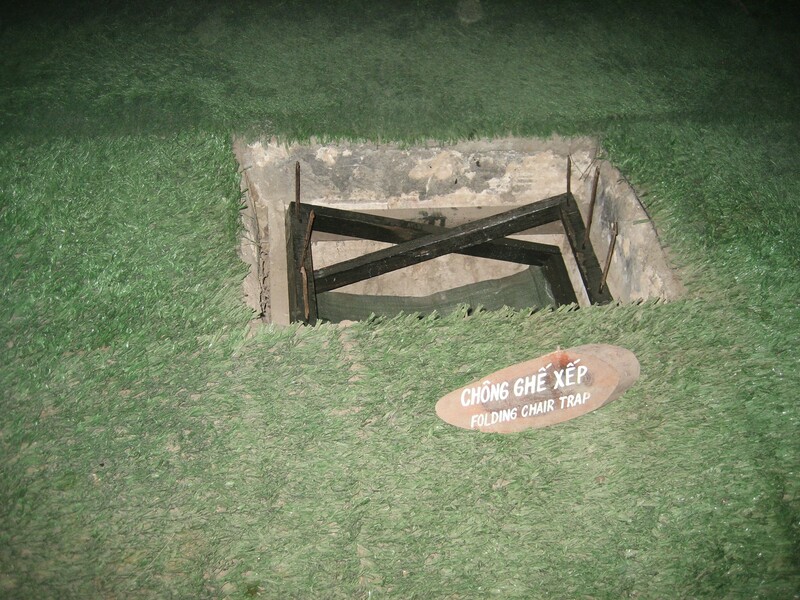 Underground in the Cu Chi tunnels, there were kitchens and rooms for dining, living and sleeping. In the picture below, the map on the left shows the tunnel network while the display on the right is a mockup of the triple-level tunnel structure. Loc was very intense as he showed us the bomb crater. As we walked along a trail in the woods, we stopped periodically to see tunnel entrances. 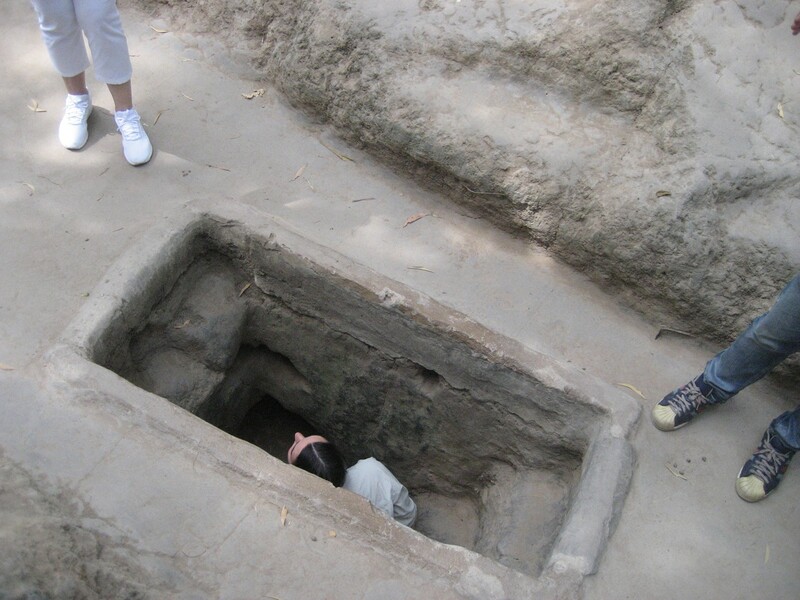 Here a young woman demonstrates how small the openings and the tunnels were. 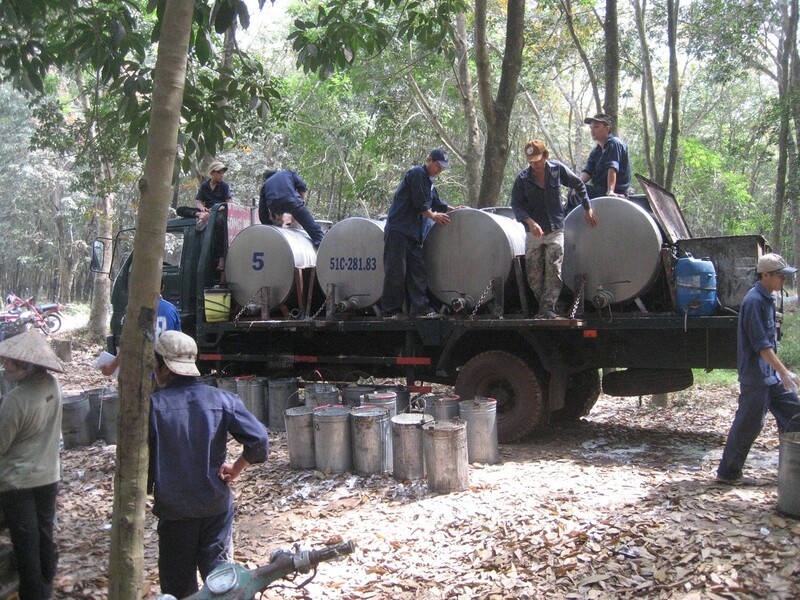 Loc stopped to demonstrate a mockup of a trap designed to injure U.S. soldiers. They had a display area setup to show the many different type of traps used during the war. There was one short tunnel that had been widened so that normal-sized people could enter and make a short crawl. Neither Pat nor I made the crawl but several of our fellow travelers did. 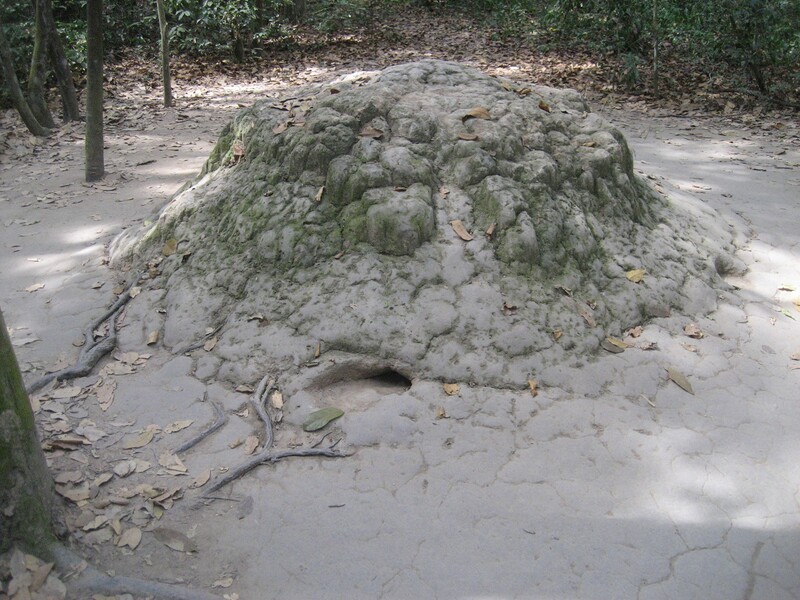 They mostly used holes in termite mounds to provide fresh air to the tunnels. 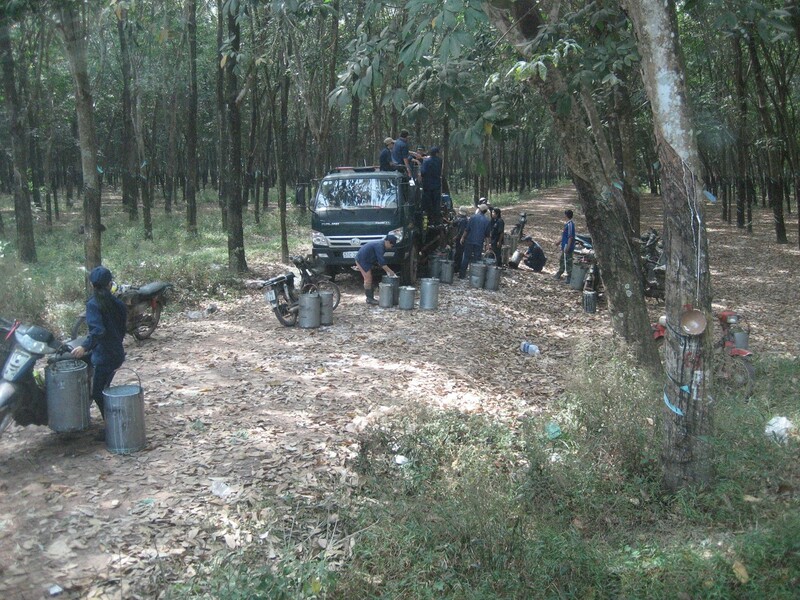 On the way back to the city, Loc spotted a group of workers harvesting sap from rubber trees and asked our driver to stop. 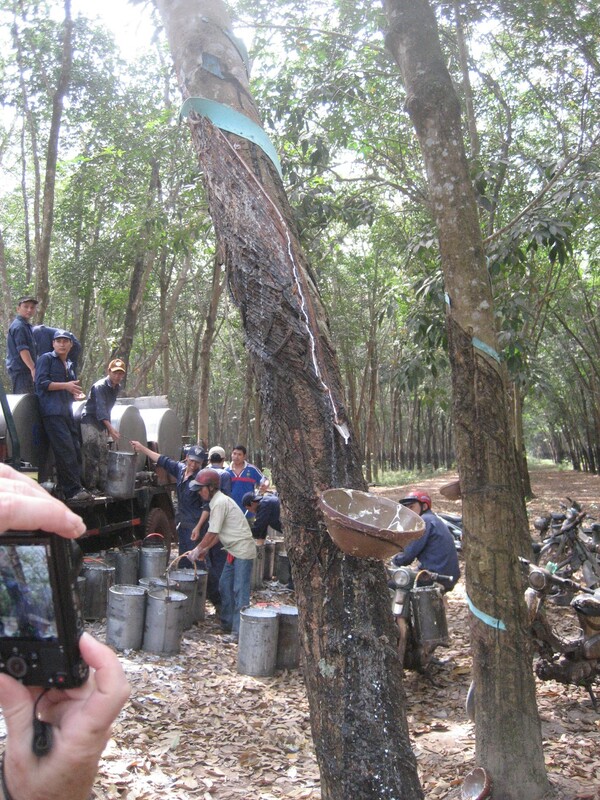 This young lady was giggling as she peeled the rubber sap from her hands. 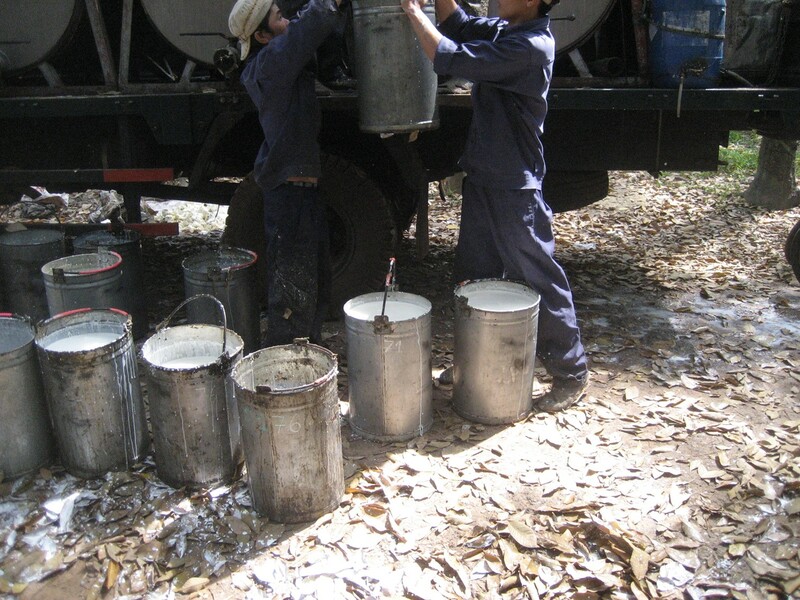 The sap is transferred from small buckets on the motor scooters to larger buckets for measuring and finally onto the tank truck. Once back in the city we had lunch and then resumed our tour with a visit to Independence Palace. This Palace occupies the site of the former residence of the French colonial Governors General completed in 1871. 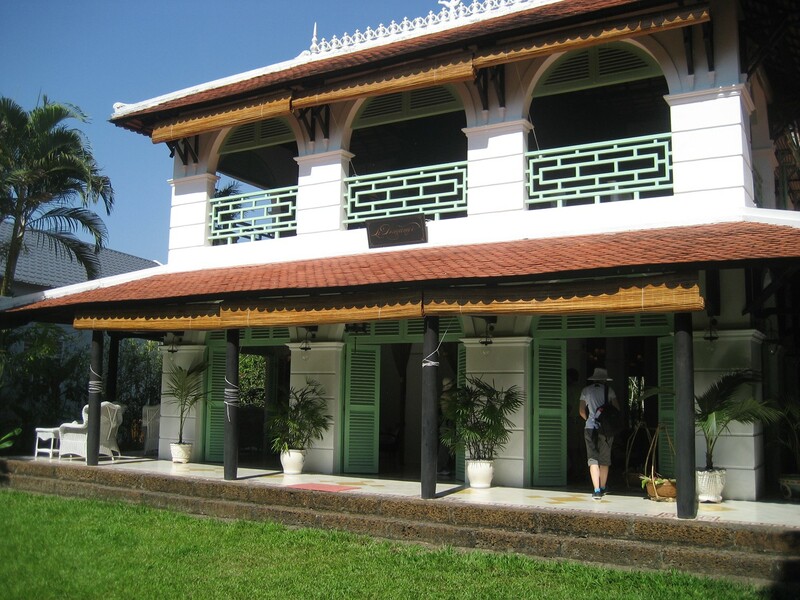 It became the residence of Saigon President Ngo Dinh Diem in 1954. 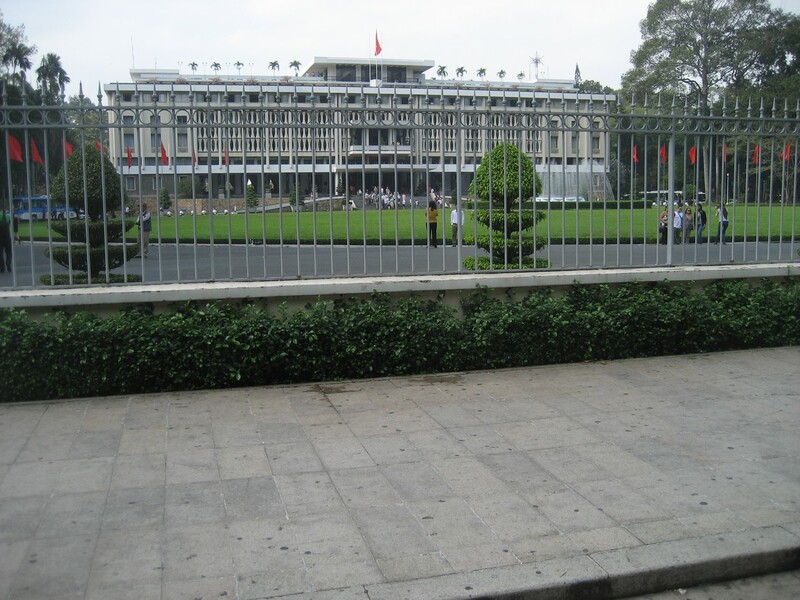 After a bomb attack on February 27, 1962, President Diem commissioned a completely new structure. 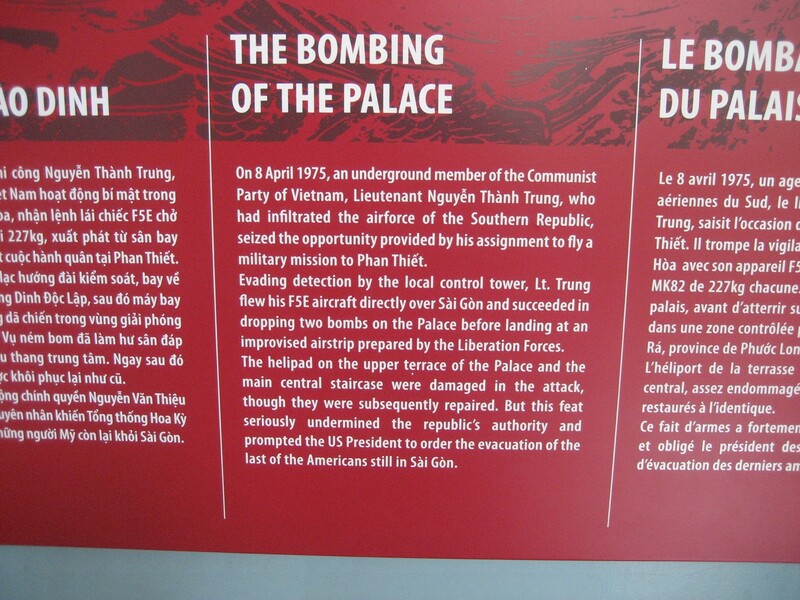 On April 30, 1975, liberation forces (North Vietnamese) entered the Palace grounds and raised the flag of liberation. From here, Pat and I left the group and walked back to the hotel. We had already seen the next two sites on the tour. 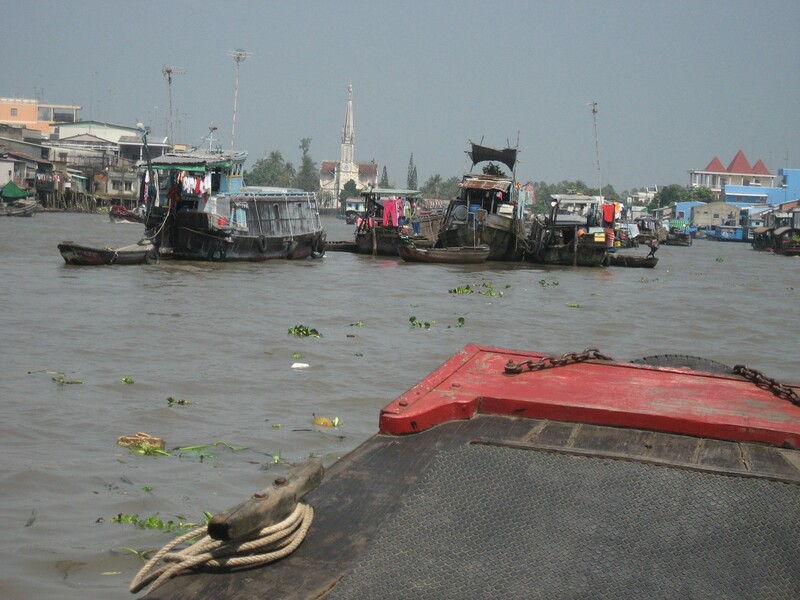 After over 2 hours on the bus, we arrived at the dock and boarded our Sampan for the trip up the Mekong River. 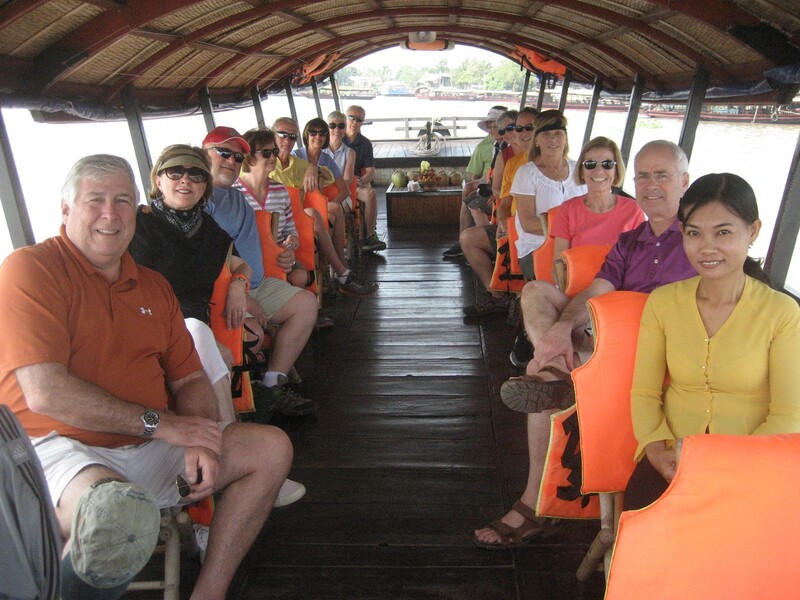 Below is a picture of our traveling companions with the boat captain’s assistant on the front right. 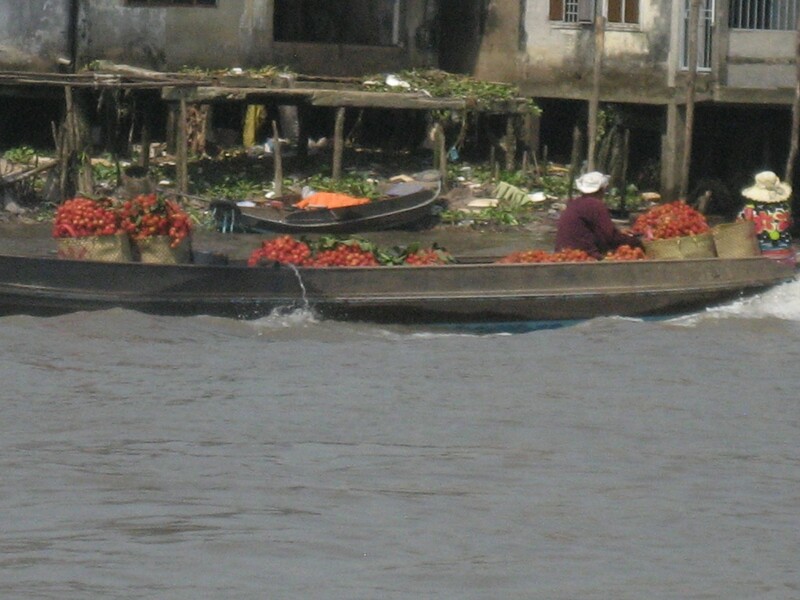 We motored past several floating markets on our trip upriver. 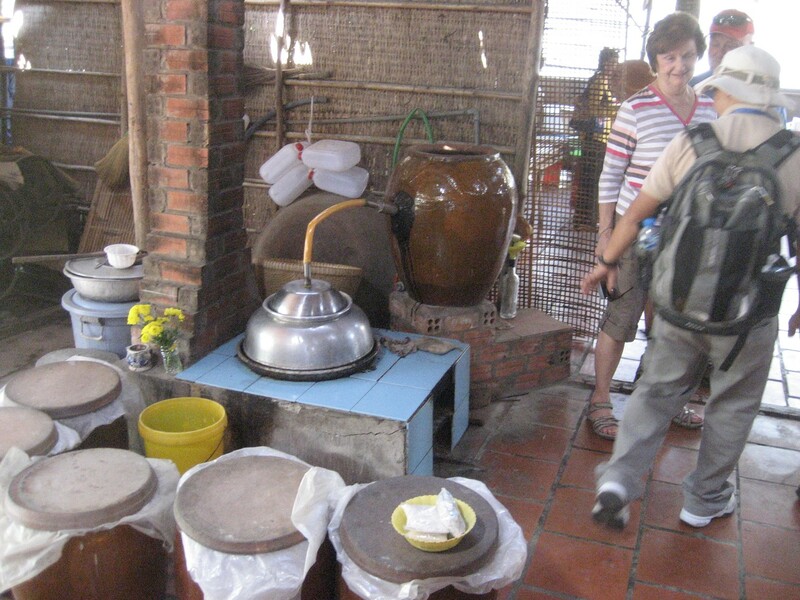 We made a stop at a place that makes rice wine. Below is the still. 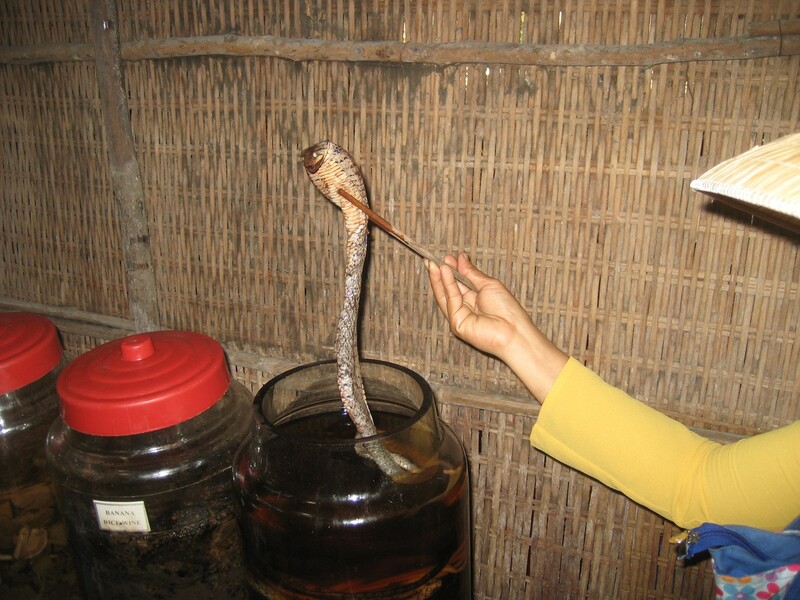 Once the wine is distilled, various ugly-looking insects and reptiles are added for the fermentation process. 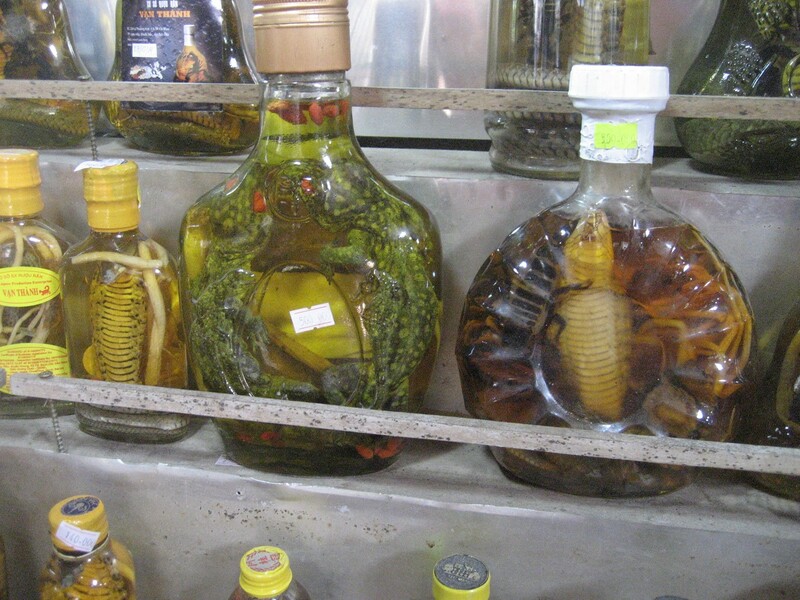 Bottles of the distilled liquor are available for sale with the dead animal inside the jar. 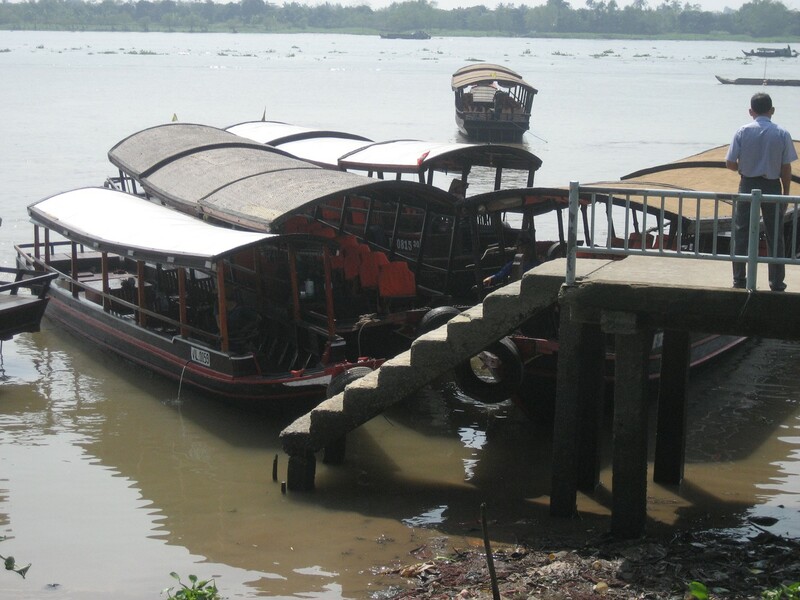 We got back on the boat and headed further up river to a restaurant that is only accessible by water. 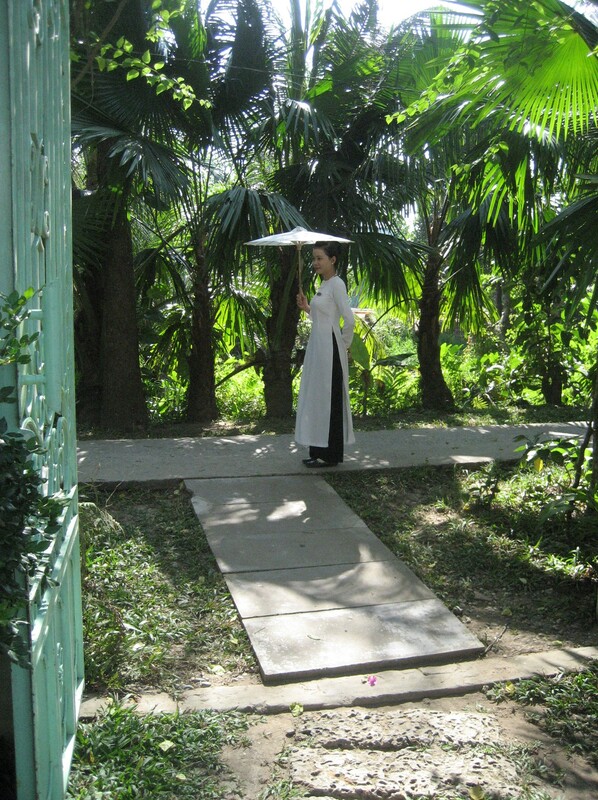 We were greeted by a young lady with an umbrella. 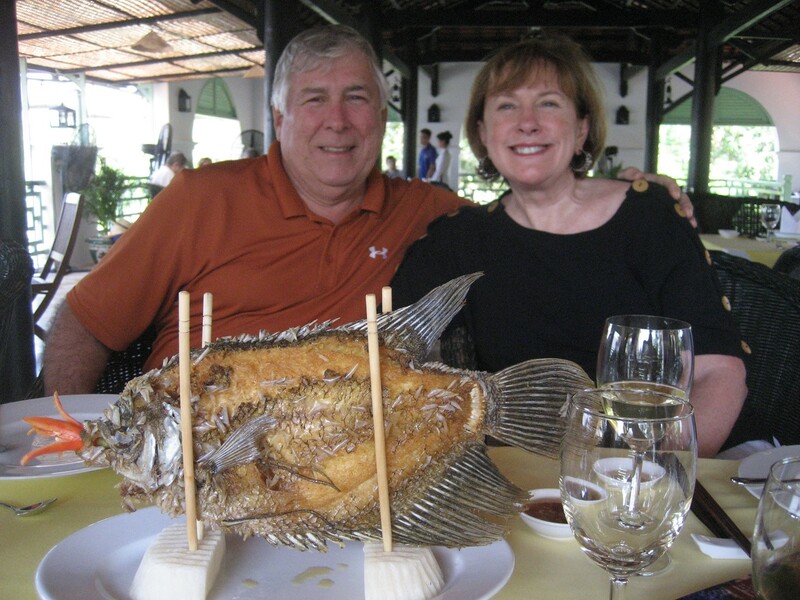 Lunch was this large river fish served at the table. 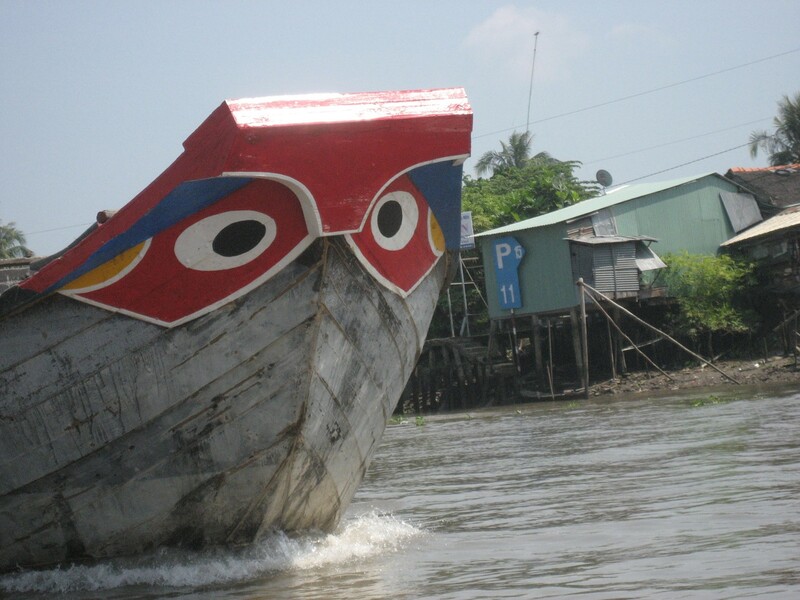 Following lunch, we returned to the Sampan and motored back down river to our launch dock. There we boarded our bus and returned to Saigon. 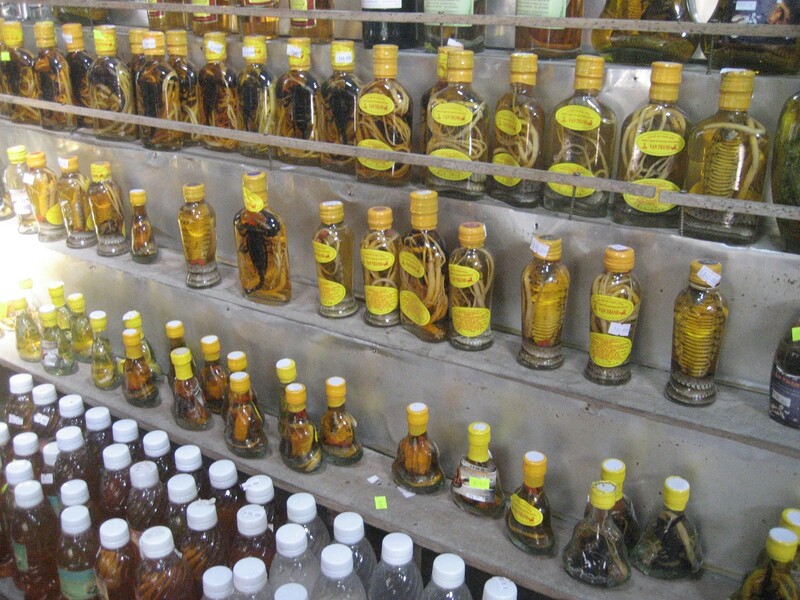 This was our last day in Saigon. 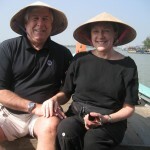 Tomorrow we return to Tan Son Nhut Airport and fly to Danang.